This image is a map of the state of Alabama by John Melish showing early roads and routes inside Alabama and their extension to the neighboring states. 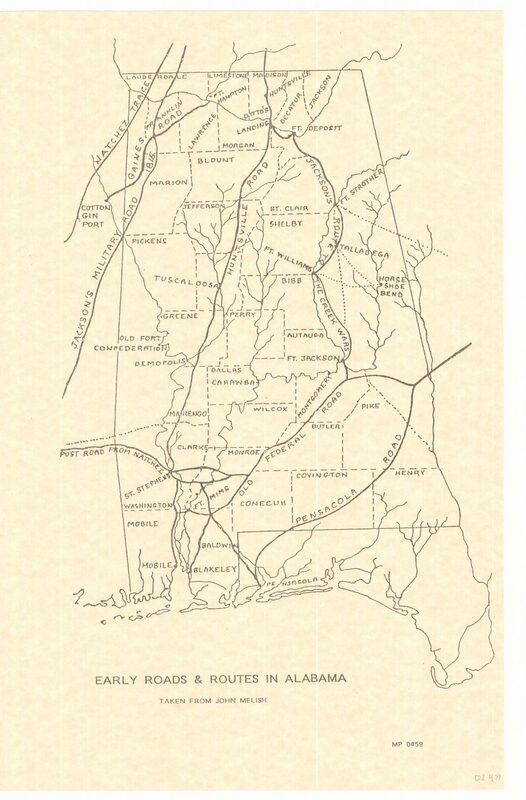 Some of the early roads and routes shown are Natchez Trace, Gaines Road, Jackson’s Military Road, Huntsville Road, Post Road From Natchez, Old Federal Road, Pensacola Road, and Jackson’s Route to the Creek Wars. The map also shows counties, cities, forts, and rivers. “MP 0459” is printed at the lower right corner of the map. The map is a printed copy of an originally handwritten map and is not encapsulated. The map is in good condition.